The U.S. women’s soccer team has sued the U.S. Soccer Federation, which pays the players’ salaries and expenses, alleging that the governing body does not compensate the women’s national team at the same overall level that it does the men. The U.S. women’s soccer team has sued the U.S. Soccer Federation, which pays the players’ salaries and a range of expenses, alleging that the governing body does not compensate the women’s national team at the same overall level that it does the men. 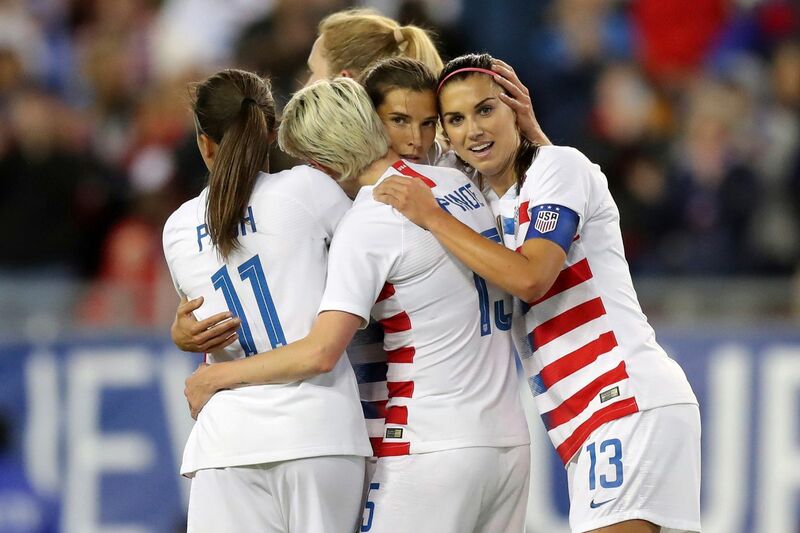 In a federal court filing made public Friday — coincidentally (or perhaps not) International Women’s Day — the team also accuses U.S. Soccer of unequal treatment when it comes to spending on infrastructure matters such as medical personnel and marketing. U.S. Soccer has not commented yet. In 2016, the women’s national team filed a complaint with the Equal Employment Opportunity Commission alleging discrimination by U.S. Soccer. Though that complaint was not resolved, this new filing reveals that last month, the EEOC told the women that they have the right to sue. The filing’s plaintiffs are all 28 professional players currently in the women’s national team player pool: the 23 players on the recent SheBelieves Cup roster plus goalkeeper Jane Campbell, defender Merritt Mathias, and midfielders Morgan Brian, Lindsey Horan (who missed the tournament because of an injury) and Allie Long. The players wish to expand the suit to class-action status encompassing all current and/or former national team players since Feb. 4, 2015. Five of the national team’s biggest stars issued statements on the news. You can read the full lawsuit below, plus some notable excerpts. 3. During his 2017 campaign for president of the USSF, current President Carlos Cordeiro, who had been a member of the USSF’s Board of Directors since 2007 and Vice President of the USSF from 2016 to February 2018, admitted, “Our women’s teams should be respected and valued as much as our men’s teams, but our female players have not been treated equally.” The USSF, however, has paid only lip service to gender equality and continues to practice gender-based discrimination against its champion female employees on the WNT in comparison to its less successful male employees on the MNT. 43. For example, for FY2016 (April 1, 2015-March 31, 2016), the USSF budgeted a combined net loss for the national teams of $429,929. But thanks largely to the success of the female players on the WNT, the USSF revised its projections upward to include a $17.7 million profit. The net profit for the WNT outstripped net profit for the MNT because the female players on the WNT were more successful in competition than the male players on the MNT – while being paid substantially less. 49. In light of the WNT’s on-field success, Plaintiffs often spend more time practicing for and playing in matches, more time in training camps, more time traveling and more time participating in media sessions, among other duties and responsibilities, than similarly situated MNT players. 50. For example, from 2015 through 2018, the WNT played nineteen more games than the MNT played over that same period of time. As the MNT averaged approximately seventeen games per year in that time frame, the WNT played the equivalent of more than one additional MNT calendar year season from 2015 through 2018. 53. Under the pay structure in effect from January 1, 2001 through December 31, 2018, MNT players received a minimum amount (currently $5,000) to play in each game, regardless of the outcome. That minimum can increase to amounts currently ranging from $6,250 to $17,625 per game, depending on the level of their opponent (FIFA-ranked 1-10, FIFA-ranked 11-24, FIFA ranked above 25) and whether they win or tie the game. 54. The USSF has continually rejected WNT players’ requests for pay equal to the pay afforded to MNT players. In response to their demand in 2012, the USSF offered WNT players compensation only if they won games against FIFA-ranked top ten teams. The USSF would not have paid them for losing games, tying games or winning against teams ranked outside of the top ten. 55. In response to the WNT players’ demand for equal pay in 2016, a representative of the USSF admitted that the USSF has and will continue to have a practice of gender-based pay discrimination. The representative pronounced, “market realities are such that the women do not deserve to be paid equally to the men.” The USSF made this statement after it already had conceded that the WNT outperformed the MNT in both revenue and profit the prior year. 56. The USSF has never offered female WNT players pay at least equal to the pay afforded to male MNT players. In fact, the USSF has admitted that WNT players have been paid less than comparable male MNT players. 57. From March 19, 2013 through December 31, 2016, WNT players could earn a maximum salary of $72,000 plus bonuses for winning non-tournament games called “friendlies,” for World Cup-related appearances and victories, and for placement at the Olympics. 58. A comparison of the WNT and MNT pay shows that if each team played 20 friendlies in a year and each team won all twenty friendlies, female WNT players would earn a maximum of $99,000 or $4,950 per game, while similarly situated male MNT players would earn an average of $263,320 or $13,166 per game against the various levels of competition they would face. A 20-game winning top tier WNT player would earn only 38% of the compensation of a similarly situated MNT player. 59. The compensation afforded WNT players for World Cup competition was even more strikingly disparate than for friendlies. 60. From March 19, 2013 through December 31, 2016, WNT players earned only $15,000 total for being asked to try out for the World Cup team and for making the team roster. MNT players, on the other hand, earned $55,000 each for making their team’s roster in 2014 and could have earned $68,750 each for making their team’s roster in 2018. 61. The pay for advancement through the rounds of the World Cup was so skewed that, in 2014, the USSF provided the MNT with performance bonuses totaling $5,375,000 for losing in the Round of 16, while, in 2015, the USSF provided the WNT with only $1,725,000 for winning the entire tournament. The WNT earned more than three times less than the MNT while performing demonstrably better. 62. The WNTPA entered into a new collective bargaining agreement with the USSF effective January 1, 2017 (“2017 CBA”). During collective bargaining for a new contract, USSF rejected requests for compensation for the WNT players that would have been at least equal to that afforded to the male MNT players. 63. The WNTPA even proposed a revenue-sharing model that would test the USSF’s “market realities” theory. Under this model, player compensation would increase in years in which the USSF derived more revenue from WNT activities and player compensation would be less if revenue from those activities decreased. This showed the players’ willingness to share in the risk and reward of the economic success of the WNT. The USSF categorically rejected this model as well. 64. The USSF continues its policy and practice of paying female WNT players less than similarly situated male MNT players on a per game basis. 74. The USSF has complete control over the timing and manner of and resources it devotes to promote national team games. Among other things, the USSF has allocated less resources promoting WNT games than it has allocated promoting MNT games; has not announced WNT games with sufficient notice to allow for maximum attendance; and has not used all available means to promote WNT games in a manner at least equal to MNT games. 75. In December 2017, the former President of Soccer United Marketing – the for-profit marketing company the USSF has used for many years to market the national teams and other soccer entities – acknowledged that the WNT has been under-marketed. She further acknowledged that the USSF has “taken the WNT for granted” and agreed that there was a need for the USSF to invest equally in the WNT and MNT. 77. The USSF further continues to discriminate against Plaintiffs and similarly situated WNT players by having set ticket prices to the WNT games at a lower price than for MNT games. The USSF’s unilateral decision to set such lower ticket prices, coupled with its decision to provide substantially less marketing and promotion support to the WNT, results in USSF-manufactured revenue depression for the WNT, which is then used as pretext for lower compensation for Plaintiffs.